NL2418 PVC layflat is similar in construction to our NL2410 Blue, however it has a slightly thicker cover and reinforcement which allows for 25-30% higher working pressures than our NL2410 Blue. 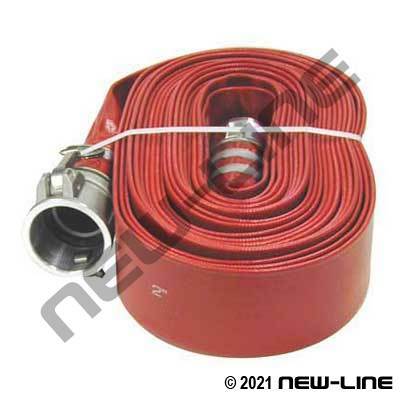 As with NL2410 Blue, NL2418 Red is still a lighter duty, economy, thin wall hose designed for open ended discharge of water in non-critical applications such as: temporary or limited use open ended low pressure water pump discharge in the drainage of pools, ponds, irrigation, flood protection, and small construction sites where no external abuse or dragging is present. It is commonly used in the Rental House Industry as an economical option to heavier duty discharge hoses. THIS HOSE IS NOT RECOMMENDED for applications such as high volume water transfer, pressure pumping water over a distance, washdown, drinking/potable water or where there is any abrasion, dragging or external abuse of any kind. Typical Fittings: Camlocks, N310-AL short shanks, N9721-AL forestry or threaded fire hose expansion ends (standby service only), N52 punch clamps.